The scalloped hammerhead shark is one of the most iconic marine species and the Galapagos Marine Reserve remains one of the best places in the world to see them. The most common of the hammerhead sharks, scalloped hammerheads are a migratory species found in warm temperate and tropical waters of the Atlantic, Indian and Pacific Oceans. They can be told apart from their close relatives by the ‘scalloped’ front edge of their hammer-shaped head (which is called the cephalofoil). 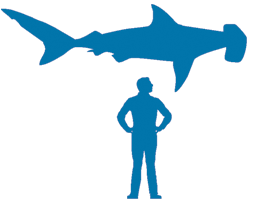 The cephalofoil has evolved to improve vision and to provide a larger area for the electroreceptors that the sharks rely upon for hunting prey on or under the sediment. The body is slender and is a brown-bronze colour on top and white below. The teeth are narrow backwards-facing triangles, perfect for seizing prey that they can eat whole rather than having to take bites out of larger prey. Their diet ranges from schooling fish such as sardines, herrings and mackerel, to stingrays, squid and even crustaceans. As with all hammerhead species, they have viviparous reproduction meaning that pups are nourished by a placental link to the mother much like mammals, and are born alive and fully functional. The gestation period lasts between 9-12 months and litter sizes can be large, ranging from 12-40 pups. Pups are born in shallow coastal areas and measure just 30-55 centimetres. Predation on pups by other sharks is high. 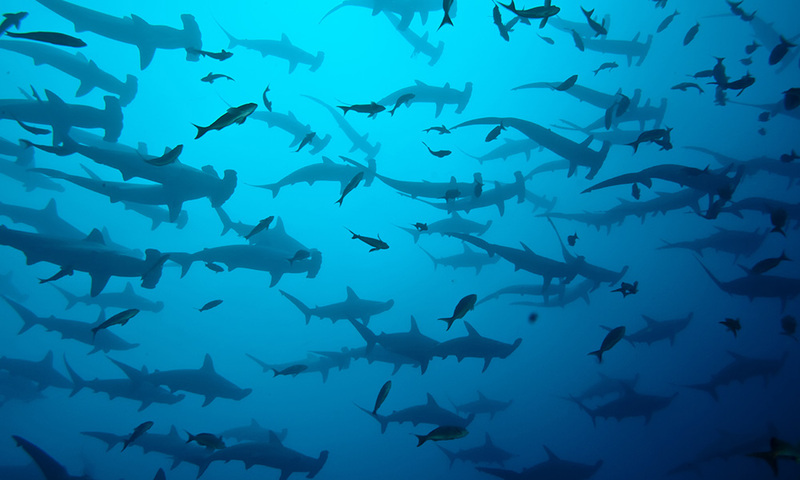 The Galapagos Marine Reserve (GMR) is one of the few places on Earth where scalloped hammerhead sharks can be seen gathering together in large schools of up to several hundred. The exact reason behind this schooling behaviour remains a mystery. In 2017, it was also found that scalloped hammerheads have nursery sites in the GMR. Where to see them: Around the northern islands of Darwin and Wolf and occasionally around Kicker Rock. When to see them: Hammerhead sharks are in the Galapagos Marine Reserve all year round but their abundance is highest in January and lowest in May. Seasonal occurrences: Mating and pupping seasons in Galapagos are currently unknown. 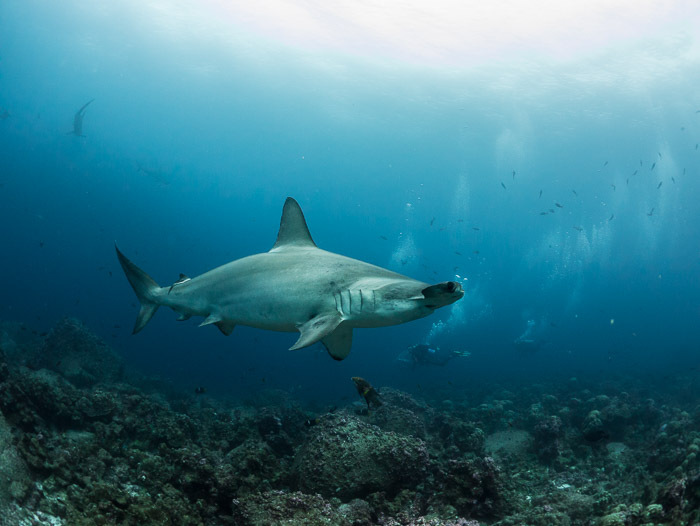 Threats: The scalloped hammerhead is an increasingly targeted species by commercial and illegal fisheries for their fins as these are highly valued in the Asian market for shark fin soup. They are very vulnerable to being caught as bycatch by trawls, purse-seine nets, gillnets and longlines. A large number of pups are also caught through artisanal coastal fisheries. Conservation Actions: Scalloped hammerhead sharks are listed on Appendix II of CITES meaning that all international trade of this species must be registered. 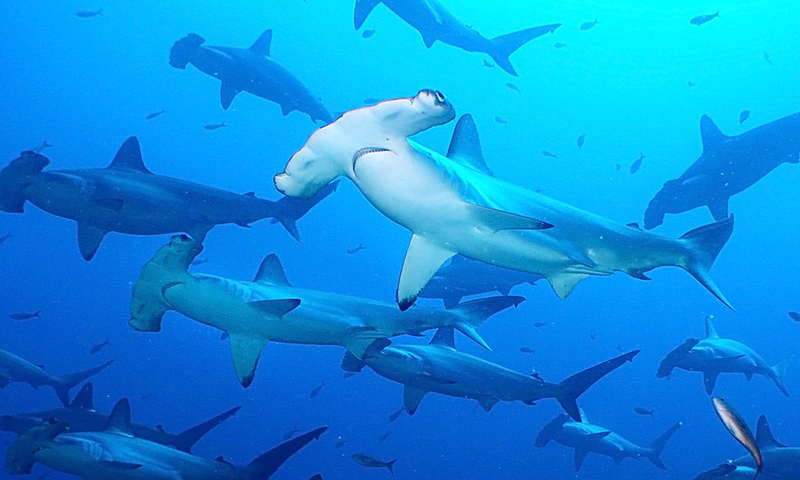 Within the Galapagos Marine Reserve, scalloped hammerheads are protected by law and, in 2007, Ecuador issued two new decrees which established better controls. We are working with partners to ensure they are protected throughout their life stages, including on their migrations, as part of our Endangered Sharks of Galapagos programme. You can help us protect scalloped hammerheads by donating today! 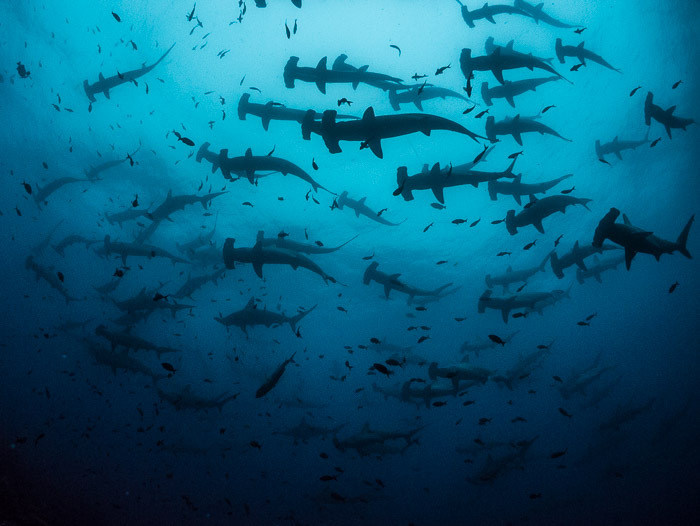 Galapagos is one of the few remaining locations where large schools of scalloped hammerhead sharks can still be seen.